FDT is an IDE for ActionScript, MXML, and haXe development. Originally developed to support PowerFlasher for internal agency needs, quickly it became a popular editor. The tools smart features increased productivity and coding comfort and as such was publicly released for the benifit of the community. In this Live session with Alan Klement the head PM for this project we walk through the ins and outs new users should notice and understand to leverage the tools features. I(Ben Fhala) play as the student and ask hopefully the right questions in this interactive interview. Where can I download FDT 5.0 and SDK's? First of all, FDT 5 is Freemium: there is a fully functional version of FDT 5 available for free. This is the perfect edition to test FDT and create smaller projects and a free alternative to learning ActionScript with a free interface. Don't worry if you don't know what an SDK is we cover this in the first video its actually really impotent to know when working in FDT or Flex so that will be the first thing in our agenda. 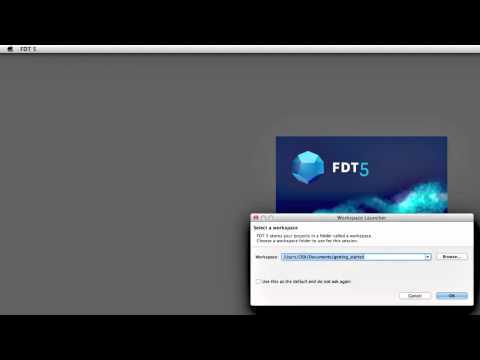 To be interactive with us as well you will need to have FDT 5.0 with you(you can download the free version directly here) and you will need to download the latest SDK from Adobe here. So lets get started in our first video we delve into SDKs and how to work with them in FDT. A software development kit (SDK or "devkit") is typically a set of software development tools that allows for the creation of applications for a certain software package, software framework, hardware platform, computer system, video game console, operating system, or similar platform. In our case the SDK is a package created by Adobe that encompass into many things but our focus will be on the framework that enables us to publish our applications and turn them into AIR/desktop/web compiled applications. Its actually really important to understand this as it will help you understand how to switch flash player versions and other important things of that nature. we continue and devle into many topics importent to people new to FDT such as the overall interface, the file types, deplying projects to desktop or mobile aplicaitons, popular worlows and so much more feel free to scan through the videos. An overview of the FDT interface. Hello world project using FDT 5.0. In this video we cover how to start a new project, the types of projects, a break down of the flex sdk, source area, bin area and libs and swcs. How to change your publish version (flash player) in FDT/Eclipse/Flash Builder. how to publish a flash file with HTML, how to change it , what do we need to know about it to get it running smoothly. How to link between projects. you might be thinking round now. Review the steps involved with building and then deploying your application to a mobile device. publish my air application directly to my phone. Two main ways of working with flash assets and FDT. one is coding in FDT but publishing in flash this way you keep your regular flash work flow and enjoy the more advanced editor available in FDT. other workflow is creating the assets in flash and then exporting them as a SWC. Download latest Adobe Flex SDK. If you are running windows you need to validate you have Java installed on your system(mac users can skip this step). Unzip the Adobe ZDK somewhere on you can easliy locate(more info in first video).